Bringing people from different walks of life together to care for our earth is a longtime dream of mine. 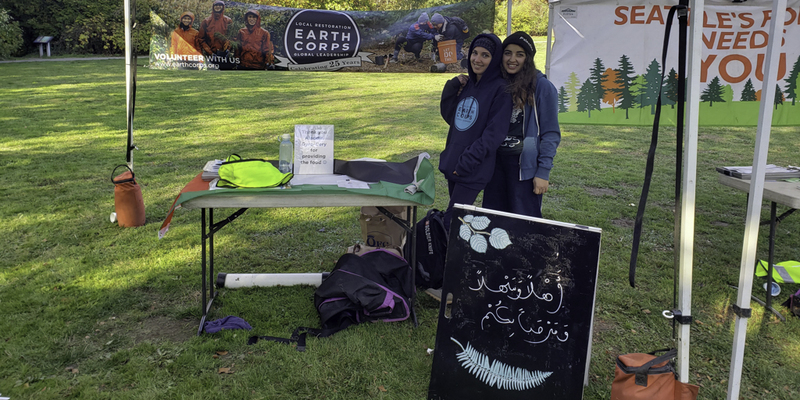 And I got to realize it this past fall when EarthCorps supported me in hosting the first ever Arabic language volunteer event in West Seattle. 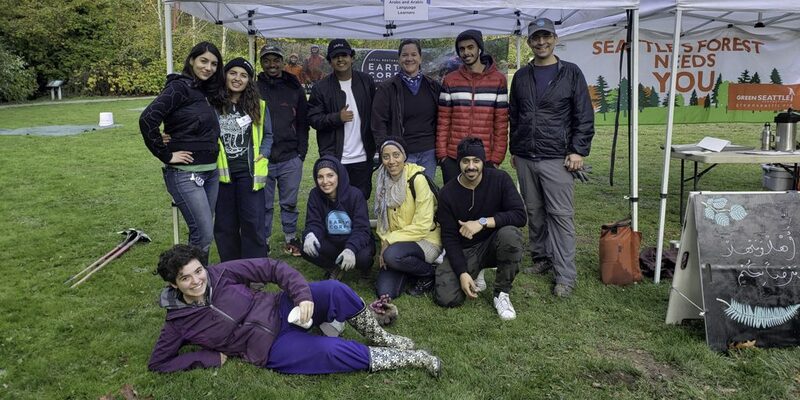 People from Yemen, Egypt, Palestine, Jordan, Saudi Arabia, the Philippines, and the United States planted trees and plants near Longfellow Creek. As we worked side by side, I hoped that someday I would lead volunteers in planting olive trees in my home land of Palestine and start an environmental volunteerism movement in the Middle East. I grew up in Jordan, a country in the Middle East considered one of the most welcoming countries for refugees. Jordan’s education is ranked among the best in the Arab world, and it is considered an origin of agriculture and civilization. Jordan is a peaceful, historical land with thousands of people coming from different parts of the world. Jordan has suffered, and is still suffering, from many environmental challenges such as desertification and drought. It is considered the third driest country in the world. Unfortunately, these challenges don’t receive much attention. War, oppression, and injustice have caused vulnerable communities in Jordan and the Middle East to lose their basic rights. Without stable housing, safety, and food on the table, it is hard to change environmental problems. But that is not the whole of the Middle East. There are many people in the region who are willing to help ensure that all communities, even the most vulnerable, enjoy the benefits of nature. But they don’t have any opportunities to volunteer. I can help create those volunteer opportunities. I’ve learned from EarthCorps that with the right tools and training, anyone can plant trees and help the environment. Through volunteering, people get the opportunity to learn something new and give back – and the rewards are way more than what you put in. My goal when I return home is to increase cultural compatibility, empathy, and humanity in the world by developing environmentally and socially just projects that engage the community in public service to protect the land and the people who live on it – not only in the long run, but immediately. By connecting people to a shared vision of a sustainable environment, we can start breaking down the barriers that divide us and celebrate our humanity. Because you can have everything but if you don’t have humanity, you have nothing. 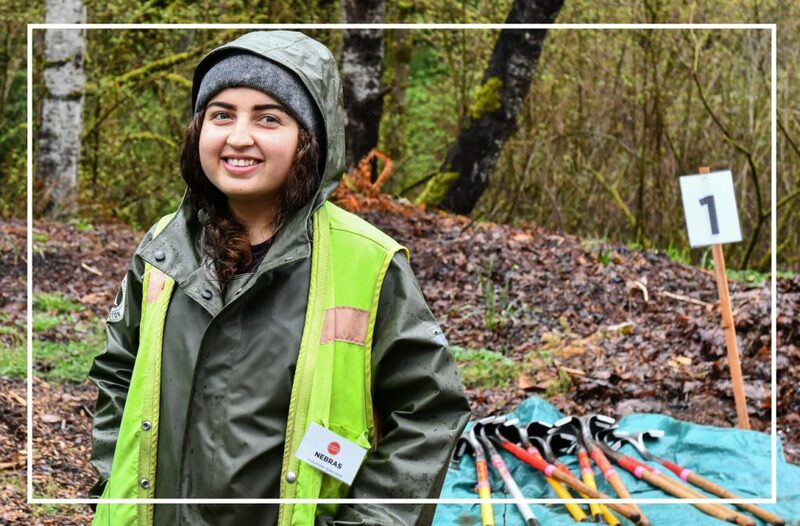 Nebras came to Seattle in 2017 as part of a cohort of international participants from across the globe to join EarthCorps. She believes that traveling with a purpose and doing valuable work in other communities, cultures, and environments gives you a totally new perspective. She says the “rope” of EarthCorps’ community connects the world and lets people know about other people who live on our shared earth.